Caterpillar is the world’s largest manufacturer of heavy construction and mining equipment. As a component of the Dow Jones Industrial Average, it’s considered a bellweather for the health of the industrial economy. The U.S. dollar: A comparatively low dollar makes U.S.-built goods cheaper overseas. A high dollar in the early ’80s nearly bankrupted the company. Link: U.S. Dollar index. 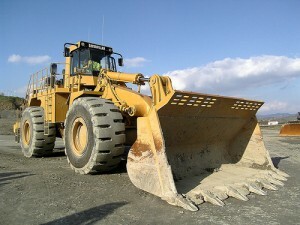 Price of steel: Cat equipment uses lots of it. Link: Steel Index. Capital expenditure trends: Generally, high commodity prices will encourage development and investment in mining and exploration equipment. Global development: Growing markets in China, India and the rest of the developing world are buying lots of construction equipment. Macroeconomic fundamentals: Cat sales rise and fall with the global economy. Cat sells a lot of tractor parts, which can prop up sales while folks aren’t buying finished tractors, but even then, it needs to sell whole tractors to create a market for parts. The Dow: Lots of large financial players buy the DJIA as an index, taking all 30 companies along for the ride. This can help Cat when times are tough, but hold it back when times are good. Cat SEC filings. The company’s disclosures to the Securities and Exchange Commission. Wall Street Journal: If you can afford to fret about Cat’s stock, you can afford the cost of an online subscription. The site’s market research section is worth the price several times over. Motley Fool. Best interface for exploring Cat fundamentals. MarketWatch: Bold splashy headlines, more attuned to traders and active investors. Bloomberg: Bare-bones but fast and up-to-date. Yahoo Finance. Has tons of links for further company research. Google Finance. Cool maps, but not especially feature-rich otherwise. StockCharts.com. Best place to do your technical analysis. Hoovers. Offers some free data but the best stuff is behind a pay wall. Financial Times. Handy for a more global perspective. TheStreet.com. Most of the sexiest stuff is behind a pay wall. Google Blog Search. Posts related to insect pupae notwithstanding, you’ll find a few interesting links here. Yahoo Blog Search. Worth a look, but not as good as Google’s. Cat Options. Yahoo Finance’s page of Cat puts and calls. DJ U.S. Commercial Vehicles and Trucks index. Good place for a look at Cat’s competitors. S&P 500 Construction and Farm Index. Same idea, slightly different focus. Seeking Alpha blog posts. Many of the best financial bloggers post here. Topix news and discussions. Nice Cat portal to blog posts, headlines and discussions.